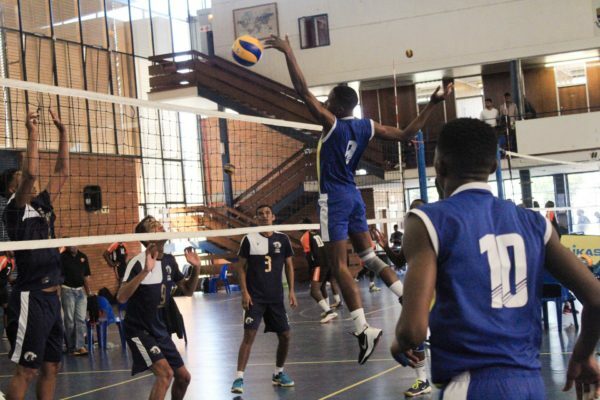 Wits Volleyball hosted the Volleyball Champions Cup for the first time. Wits volleyball hosted 37 teams as part of the Volleyball Champions Cup at the Old Mutual Sports Hall on west campus from April 26 to 30. The Wits teams did not fare as well they expected with the ladies knocked out in the group stages while the men’s were eliminated in the last 16. Wits volleyball chairperson and member of the women’s team, Stacey Nheera, who was visibly emotional about the performance of both teams, said “We are making history this year. Volleyball is considered a recreational sport but this tournament will prove that we can be competitive,” Nheera said. The Wits men’s side played the Lotus Lions in their first game coming away with a 3-1 victory. Their next two games were played against Maidstone and Quantum which they lost 0-3 both times. The team can be commended though for maintaining a strong defense in all their games. Men’s team captain, Comfort Munya told Wits Vuvuzela that despite the losses he was proud of his team’s effort and how well they had played. The Wits women’s side were determined to prove themselves as a team as they had only been training for three months. The ladies lost two of their three games. Their best showing was against Quantum where they lost by one point after a strong performance and an almost near perfect defense. HIGH BALL: The Wits men’s volleyball team in action at their game against the Lotus Lions. Photo: Naeemah Dudan. Men’s team player, Thabo Morudu, said that the performance of the Wits volleyball this year was good. “The volleyball executive team, together with the sports admin worked tirelessly the past year to build a very competitive team which never existed three years ago. The next step is to host the USSA games in June/July,” he said. Wits Volleyball is part of the Johannesburg Volleyball Union league, where the current standings place the men’s team first and the women’s team third.